Building Collector: Cleopatra's Needle Obelisk Made by Tiffany & Co.
Cleopatra's Needle Obelisk Made by Tiffany & Co.
Replicas of Cleopatra's Needle in New York’s Central Park were made by none other than Tiffany & Co.
Two materials, bronze and lead, exist and they each stand 15 inches tall. 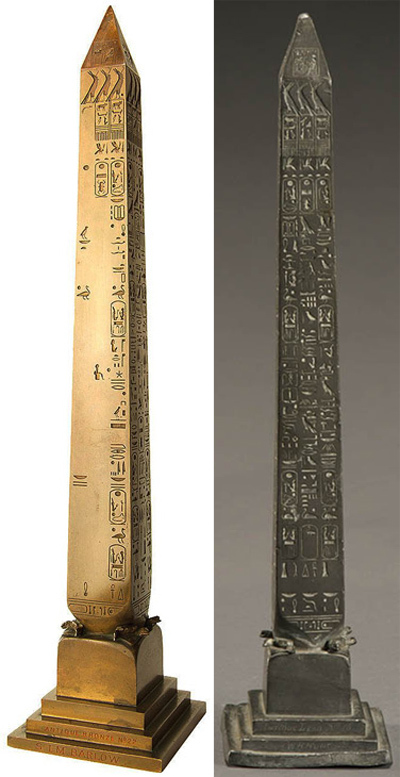 According to Piraneseum, “In 1879, under the sponsorship of business mogul William Vanderbilt, naval engineer Henry Gorringe set sail for Alexandria, Egypt, to retrieve the ancient Obelisk of Thutmose III (soon to be called Cleopatra’s Needle) and bring the 200 ton monument to New York. On January 22, 1881, the Needle was erected in Central Park, where it stands today. To commemorate the undertaking, Gorringe commissioned from Tiffany a small number of bronze models of the Obelisk, which were distributed to colleagues as well as those who had supported the undertaking. 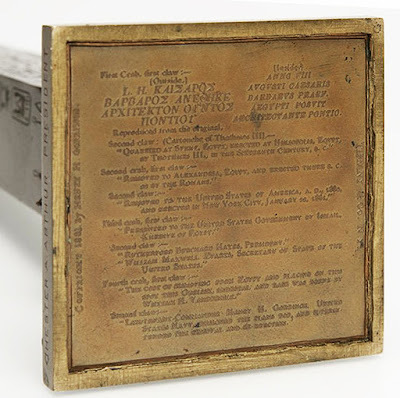 This very highly-realized model was presented to Samuel L. M. Barlow, lawyer/tycoon/political intriguer and almost certainly an acquaintance of Vanderbilt.” I saw another replica very similar, but made of lead and inscribed on base, “Antique Lead No. 16 W.H. Hunt.” William Henry Hunt (June 12, 1823 – February 27, 1884) was the United States Secretary of the Navy under President James Garfield. The New York Historical Society has one in it’s collections made of lead and theirs is inscribed to Walter B. Lawrence.David Weingarten added, "The bronze examples far outnumber those in lead. 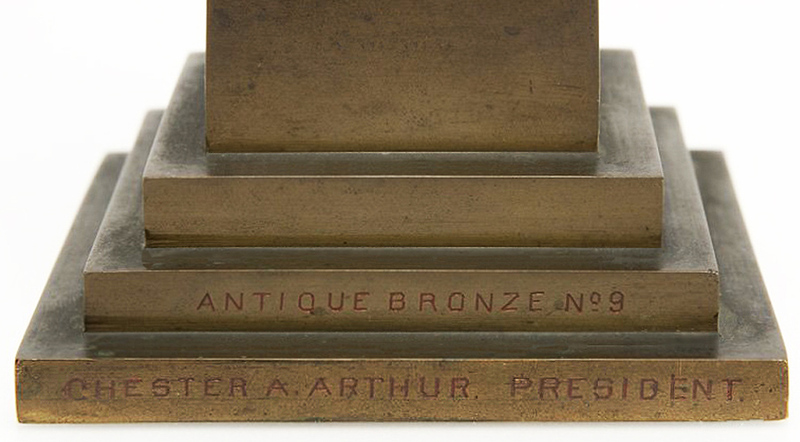 Among the more puzzling of the bronze examples is one presented to "Chester A. Arthur. President." When the obelisk was put in place in Central Park, January 22, 1881, the President was Rutherford B. Hayes. After Hayes, it was James A Garfield, who served from March 4, 1881 until his assassination September 19, 1881, at which point Arthur became President. Does this suggest that these models were not produced for the January 22 dedication?